We all have those things that bring out our softer side....yes even me, for those of you with your mouth hanging open. For me...it's those snowy winter days when all the world seems to be a little better. Days with the snow steadily falling outside reminds me of some of the happiest days of my life. So many years ago, I was a little girl with pig tails, playing outside all day in a very, very rural town in Iowa. Back then I played for endless hours in snow drifts with only my imagination and my faithful little dog by my side. Together we tunneled for miles (or so it seemed) in elaborate mazes. I spent too many hours to count, siting outside (in so many clothes I couldn't move) to listen and watch the snow come down. I felt even then, that world seemed to be a little calmer and at peace. It's as if life stops in time with no sound but the snowflakes touching down. I remember those moments as I would track a single snowflake as it fell and tried to hear the the sound as it touched down. As you can imagine...I was unsuccessful. 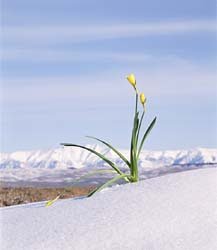 Even as I reminisce about the happy memories of childhood and what winter means to me...I am also excited about spring. Winter is the time when all things take a rest, wait for the weather to warm and then show themselves with renewed vigor. Spring is a time when the earth shows how beautiful life can be....to live with everything you have. Back off with that crap...before I have to beat you up for your filthy words!!!! Is Sonya passing out "Warm Fuzzies" ??? I think they just dropped the temperature in Hell a couple of degrees!